1. If You Leave Your Life To Chances You Might Endup Not Having Chance. Nothing Great Happens By Luck. Lucky Is The Middle Name Of Great People That Labor Under Correct Knowledge. 2. Whatever You Make Happen For Others, God Will Make Happen For You. If You Give Way For Others God Will Make Ways For You. Whatever You Want To Receive From God Is The Multiplication Of What Others Receive From You. 3. 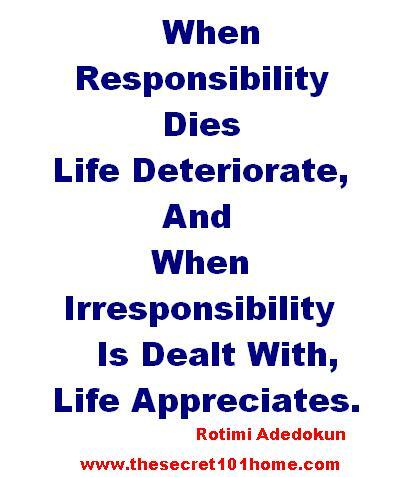 When Responsibility Dies Life Deteriorate, And When Irresponsibility Is Dealt With Life Appreciates. Nothing Happens Except Someone Makes It Happen. No Vision Come To Pass By Picture, No Dream Become Reality By Words. 4. Those Who Seek Comfort Will End Up Discomforted And Those Who Embrace Hardwork Will Find Results. Real Living Is From Discomfort To Comfort Not Comfort To Discomfort. 5. Never Go To Bed Without Completing The Task For The Day. You Will Have An Uncompleted Date Added To The New Day. The Secret Is That Nothing Is Worst Than Unfinished Project. The Reasons Is Simple. It Is Better To Remain With Crowd Than Start A Journey Of A King And Not Finish. 6. If Life Really Matters To You, You Will Give Everything To Make It Count. If Something Is Important To You Will Give All It Takes To Get It. What You Don’t Want You Don’t Press For, All That You Have Are All What You Worked For. 7. Greatness Don’t Come Easily If You Have One, Expect It To Disappear Soon. There Is No Overnight Success, If You Have One That Means Someone Is Up Throughout The Night To Make It Happen. This entry was posted in Creation and Wisdom, Life and Time Management, Self Development, Spirituality, The Peace, The Secret, Vitamin Of The Mind, You! and tagged How to define life, Life 101, Life By David Oyedepo, LIfe By JIm Rohn, LIfe By Pastor E A Adeboye, Life By Rotimi Adedokun, The Definition Of Life, What Is The Life. Bookmark the permalink.